Once you have your design laid out on paper, it needs to be transferred to the block of soapstone. I am assuming that you are doing a relatively flat piece. More complex pieces are beyond the scope of this overview. Be sure that your design does not have any undercuts. Undercuts will act like a physical lock and prevent the hardened metal from coming out of the mold. The diagram below shows the basic principles of laying out a design. You need to create a cavity that will allow the metal to come out of the mold once it is cooled. 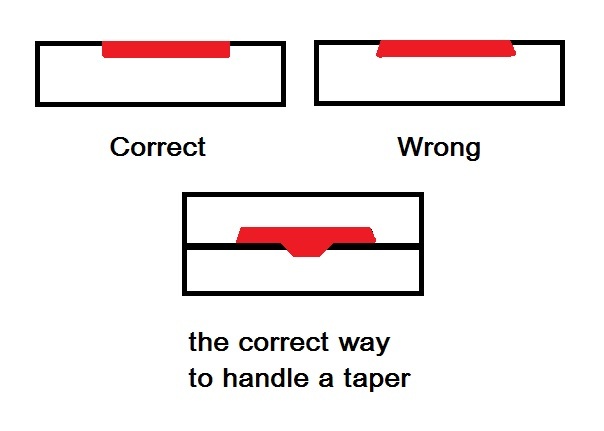 The bottom diagram shows how to place a double tapered piece so that it uses the opposite block of stone to end the taper and does not create any undercuts. One very important thing that you need to consider when you are doing the design layout is where the metal will be poured into the mold. Where is that not particularly attractive piece of metal, called a sprue, going to connect to your finished piece? It needs to be attached so that it can be cut off and filed flat without ruining your design. The sprue also needs to be large enough to act as a reservoir for extra metal. Metal shrinks as it cools, and having extra metal that your piece can pull from is a good thing. You may need to experiment with increasing the size of your sprue if your piece does not cast correctly, so try to allow for that in your planning. This is the general layout for a basic soapstone mold design. 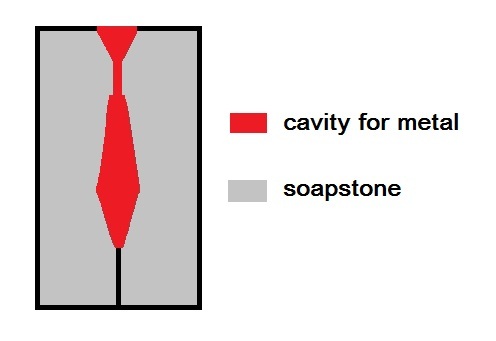 The cavity for the metal is centered within the block of soapstone, except for the sprue, which goes to the edge of the block and ends in a funnel shape, to make it easier to pour in the metal. There are no undercuts that will trap the hardened metal and keep it from releasing from the mold. The design that you have chosen needs to be transferred to your soapstone blocks. This can be a bit challenging the first time that you try it because you need to work three dimensionally. Transferring the design can be done by tracing around a cut-out copy of the design with a pen or pencil, if it is a simple shape. If this does not work well enough you may want to score the block using a sharp implement. This is also helpful if you need to add more detail. You can make small dots that act as reference points. You need to decide what will work for you. Some types of carbon paper will allow you to trace the entire design onto the block. Experiment. You may need to trace the design in stages, depending on its details. This is especially important because of the need to work in a three dimensional fashion. If you have designs on multiple levels of a piece, you may need to trace them on in stages as you carve down into the block. This entry was posted in Metal Casting by Eirny. Bookmark the permalink.